Jake Nussbaum is an associate in the Litigation practice. 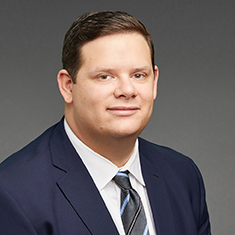 While in law school, Jake was a member of the Fordham Urban Law Journal and served as a student representative on the Faculty Committee on Admissions and Financial Aid. Jake also worked in the Fordham Federal Litigation Clinic and was a judicial extern for the Honorable Kelly O'Neill Levy of the New York Supreme Court. As a result of his achievements in law school, he was named a Paul Fuller Scholar and was awarded the Archibald R. Murray Public Service Award for his dedication to pro bono work. Shown below is a selection of Jake A.’s engagements.